Minot State University’s Program of Theatre Arts presents William Shakespeare’s “A Midsummer Night’s Dream,” re-envisioned and directed by Aili Smith, associate professor and co-chair within the Division of Humanities, Thursday through Saturday (Oct. 22-24) in Aleshire Theater at 7:30 p.m. The doors will open at 7 p.m. A matinee performance will be held Saturday (Oct. 24) at 2 p.m. with the doors opening at 1:30 p.m. In this colorful tale, love, drama and mischief descend upon a magical world where anything is possible. Shakespeare’s classic comedy is about the misadventures of star-crossed lovers, fairies and a troupe of actors. Set on a midsummer’s night, the story begins with the announcement of the nuptials of Theseus, duke of Athens (Jenny Castro), and Hippolyta, queen of the Amazons (Erin Kampen). Then Hermia’s father, Egeus (Casey Feldner), threatens to deprive Hermia (Madison Curtiss) of her true love, Lysander (J’Kobe Wallace). He forces her to choose between her true love and certain death or Demetrius (Jaryn Homiston), the man he would prefer she marry and who is loved by Helena, Hermia’s best friend (Maddie Thompson). The lovers, Hermia and Lysander, flee into an enchanted forest filled with fairies and are followed by Demetrius and Helena. When mischievous Puck (Jason Gaarder) mistakes one Athenian for the other, the misadventures begin. And that is just one of the plots. The cast includes many talented MSU students, faculty, staff and alumni cast in various roles. Shakespeare artfully and imaginatively wove together mistaken identities, misunderstandings and misadventures with his trademark genius for words and wit. The result is a comedy that remains as engaging and exciting as it did when it first graced the stage in the late 1500s. For tickets, contact the MSU theater box office at 858-3172. Tickets are $10 for adults; $5 for seniors, students and children under 18. MSU students, faculty and staff are free with current MSU ID. There will be no intermission. Reservations are strongly recommended. For questions, contact the Aleshire ticket box office at 858-3172, or Smith at aili.smith@minotstateu.edu. Pictured: Ryan Haider, Rick Watson, Conrad Davidson and Thomas Rakness rehearse for the upcoming production, "A Midsummer Night's Dream." Minot State University invites prospective students and their families to “test drive” the university at an open house and Preview Day. The open house will be Thursday (Oct. 22) in Ann Nicole Nelson Hall from 8 a.m. to noon, or Friday (Oct. 23) from 1 to 4:30 p.m. Preview Day is Nov. 21 in Aleshire Theater from 9:30 a.m. to 3:00 p.m.
MSU’s open house allows prospective students and their families to explore university life and tour Minot State’s campus. Representatives from the College of Business, College of Arts and Sciences and the College of Education and Health Sciences will speak, and participants may listen to breakout sessions on campus life, financing college and selecting a major. Prospective students can schedule a time to meet with faculty to discuss programs of study. Preview Day is designed to educate prospective students and their families about MSU’s numerous programs. Participants can attend up to three presentations covering topics such as potential career fields, the Honors Program and student life. Presentations at Preview Day are unique in that they will be similar to TED Talks, which are short, up-tempo, high-energy and thought-provoking presentations given by students, faculty and staff. For questions, contact Tyler at katherine.tyler@minotstateu.edu or 701-858-3140. "Ararat," the 2002 French/Canadian film, carries the Northern Lights International Film Series forward Monday (Oct. 26) in Aleshire Theater at 6:30 p.m. Atom Egoyan's masterpiece deals with the genocide of Armenians living in Turkey during World War I. Hayk Margaryan, Minot State University student from Armenia, will lead discussion. An international buffet begins at 6 p.m., with the screening at 6:30 p.m. The event is free and open to the public. There will be a door prize drawing for a gift card to the series sponsor, Broadway Bean and Bagel. The next film is Ingmar Bergman's "Cries and Whispers" on Nov. 16 with discussion leader Conrad Davidson, dean of the College of Arts and Sciences. For questions, contact Scott Sigel, assistant professor of foreign language, at scott.sigel@minotstateu.edu. In collaboration with Lake Region State College and the North Dakota School for the Deaf/Resource Center for Deaf and Hard of Hearing, Minot State University will offer a Bachelor of Applied Science in interpreting and sign language studies. The North Dakota State Board of Higher Education recently approved the degree, which is expected to be offered beginning spring semester 2016. For questions, contact Pedersen at holly.pedersen@minotstateu.edu or 858-3050. The North Dakota Center for Persons with Disabilities, a Center of Excellence at Minot State University, has been awarded a $289,518 grant from the U.S. Department of Education-Office of Post-Secondary Education under the Transition and Postsecondary Education Programs for Students with Intellectual Disabilities to support the Advancing Students Toward Education and Employment Program (ASTEP). ASTEP helps young adults with intellectual disabilities, living in rural communities, transition into post-secondary education, resulting in improved employment opportunities and greater life skills and self-determination. “Today’s grant will support better outcomes for our state’s youth who live with intellectual disabilities and help them to have a higher quality of life and more independence,” Senator John Hoeven said. Amy Armstrong, project director, indicated the new grant will build on the previous ASTEP program, funded from 2010-2015 at MSU. ASTEP comprises inclusive college course work, career development, self-determination, independent living and pre-employment skills training and campus inclusion. NDCPD anticipates the grant will be funded for a total of five years with a cumulative budget of approximately $1.5 million through the year 2020. For questions, contact Armstrong at amy.armstrong@minotstateu.edu or 800-233-1737. Campus Players presents its annual Halloween Rocky Horror Picture Show Party on Friday (Oct. 30) with special guests, the Magic City Misfits, performing alongside the screening as members of the eclectic cast. This wild, tongue-in-cheek, audience-participation event is set to the 1975 movie, “The Rocky Horror Picture Show!” This movie is a humorous tribute to the science fiction and horror B movies of the late 1930s through early 1970s. It centers around sweethearts Brad and Janet (Barry Bostwick and Susan Sarandon) and their misadventures in the eerie and “festive” castle of Dr. Frank-N-Further (Tim Curry). The preshow begins at 11:15 p.m. with the screening and performance at 11:45 p.m. The doors open at 10:45 p.m. This event is free and open to the public. Special audience participation prop bags are available for purchase, and costumes are encouraged! The film contains language and themes not suitable for all ages or all audiences; mature audiences are advised. Anyone under 18 must be accompanied by an adult. Minot State University is an alcohol-free and tobacco-free campus. Contact Krys Zorbaugh, Campus Players president, at campusplayers@minotstateu.edu with questions. Daniel Persson, an investigative reporter based in southern Sweden, visited the Minot region Oct. 5-8. Currently a 2015 Transatlantic Media Fellow with the Center for Strategic and International Studies in Washington, D.C., Persson is studying the influence of the American labor movement in the 21st century and the role of consumerism in Americans’ daily lives. He is focusing part of his research on the role of labor in entrepreneurial companies. Persson explored the Bakken oil patch and discussed media careers with vocational and Minot State University students. The Minot Area Council for International Visitors developed local programming for him. Pictured: Daniel Persson converses with Frank McCahill, communication arts assistant professor. 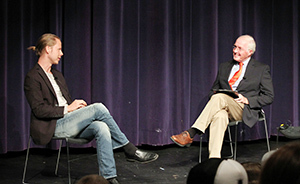 MSU students questioned Persson about careers in journalism and other media avenues. Minot State University welcomes new employees, Josh Sandy and Rachel Small. Sandy, director of athletics marketing and promotions, recently graduated from MSU with a bachelor’s degree in broadcasting (public relations concentration). He returns to MSU after a four-month stint as a KMOT account executive. He is proud to be a Beaver! Small is an admissions specialist in the Office of Enrollment Services. Previously, she worked in civilian human resources for the U.S. Air Force in Misawa, Japan. She completed as associate degree at Cowley Community College, Wichita, Kan., and a bachelor’s degree in psychology from Troy University, Fort Walton Beach, Fla. She enjoys reading, bowling and keeping up to date with the latest action movies. She and her husband, Joshua, have two dogs. Oct. 21-29 — "Americas 2014: All Media Best of Show,” photography by artist Edward Shmunes, Columbia, S.C., best-of-show winner from Americas 2014: All Media juried competition, Library Gallery. Oct. 21-Nov. 13 — "What Comes Before Words," mixed media sculpture by artist Patrick Luber of Grand Forks, Hartnett Gallery. Department of Mathematics and Computer Science faculty Elaheh Gorgin, Stephen Hayton, Surya Thapa Magar and Timothy Morris and student Nick Theis attended the North Dakota Mathematics Association of Two Year Colleges conference Oct. 2-3 in Carrington. The conference focused on “Discovering the Art of Teaching and Learning Mathematics Using Inquiry-Based Learning” with presenters Christine von Renesse and Volker Ecke. Lesley Magnus, associate professor of communication disorders, presented “Enhancing Phonological & Metaphonological Skills of Highly Unintelligible Speech: The Hodson’s Cycles Approach” Oct. 16 in St. Louis, Mo., at a conference for state speech-language pathologists. Mary Mercer, special education adjunct faculty and NDCPD assistant director for program management, presented “Special Education Career Ladder for Adult Service Provider Staff: Collaboration among University Special Educators, Adult Support Agencies, and State Government at Minot State University” at the 2015 American Association on Intellectual and Developmental Disabilities-Ewha Symposium, Beyond Opportunity, Quality Education for All in Seoul, South Korea.